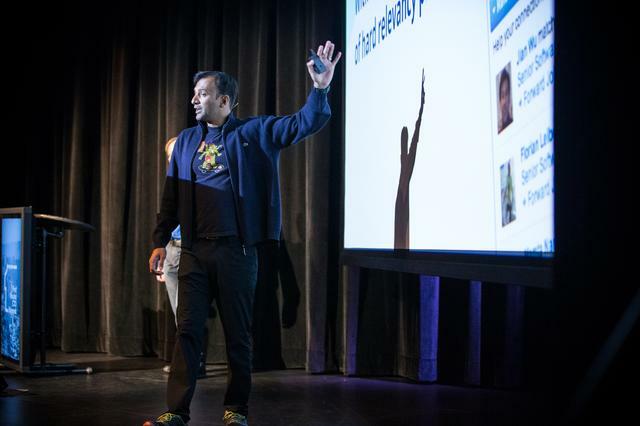 This is how DJ Patil kicked off his session at First Round's recent CTO Summit. Former VP Product at RelateIQ, and now Chief Data Scientist of the United States, Patil said that 20 minutes was not nearly enough time to sum up all the missteps that yielded transformative lessons for him. On stage with Ruslan Belkin, now VP Engineering at Salesforce by way of RelateIQ, he said their goal would be to share only the most important, most salient mistakes and learnings related to building and launching data products. That starts with the common mistake that the term “data products” only refers to apps like Twitter or LinkedIn, where social graph is everything. Increasingly, more and more products are falling under this umbrella, including hardware, wearables and anything else that collects and makes data meaningful for users. To that end, the advice Belkin and Patil have to offer applies to the entire startup ecosystem. Truly, it comes down to the fact that building data products at scale is really hard. Here, Belkin and Patil offer a number of insightful tactics that they learned the hard way, so that others can have an easier time and start creating bold, new products that will change the way we see and connect with the world. Hacking things together and prototyping may be just as easy with data products as it is with others. But at scale, you run into a bunch of unique challenges. You have to have an arc or plan of progression in mind. They are never one-offs or standalone products. So you can't just build, test, roll and go, like you might be used to. You have to start with a very basic idea: Data is super messy, and data cleanup will always be literally 80% of the work. In other words, data is the problem. “If you take something like LinkedIn in the early days, let's say, there were 4,000 variations of how people said they worked at IBM — IBM, IBM Research, Software Engineer, all the abbreviations, etc.,” says Patil. If you're not thinking about how to keep your data clean from the very beginning, you're fucked. I guarantee it. "Trying to clean it up after the fact will take months at least." One of the best examples of this also comes from LinkedIn. It's the mechanism that shows you who has recently viewed your profile. That's the kind of information that will drive traffic back to your site and keep it coming back. When you add more data, you put your user into paralysis. They have no idea what to do. Deciding what data to expose to people isn't just about how much — it's about what it says too. One idea Patil and Belkin played around with was marketing jobs to people — like, “Hey, you should apply for this job because it matches your skills!” Soon, they realized this approach was fraught with peril. The clever solution in this case was to approach job recommendations from a different angle. If "Bill" is the user they are trying to reach, then instead of sending recommended job openings directly to Bill, they decided to send them to his network with the short note: Recommend Bill for this job. It used the exact same algorithm, but with a little twist, it took care of the hard relevancy problems. This is a favorite saying of Belkin's, emphasizing the importance of getting things out the door, trying them out, and then iterating once you have more knowledge. 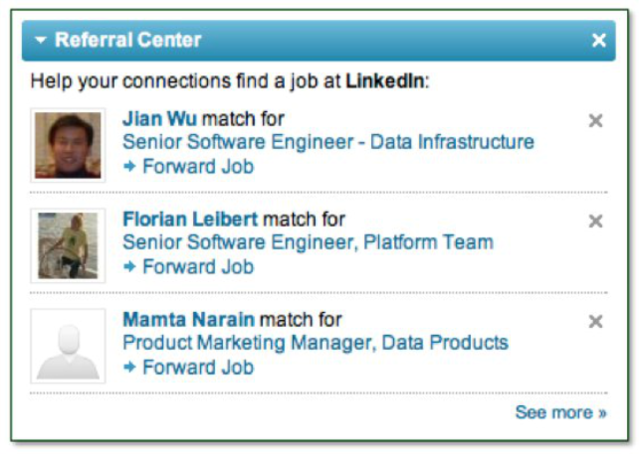 A while ago, LinkedIn built a product called Talent Match. The idea was that a company should be able to post a job opening and get the best recommendations for people who fit the description. It worked awesome until they tried to scale it and all sorts of complexities emerged. “It turned out that we had to iterate on all these systems until we were able to understand the right combination of features, the right evaluation framework. Until we got that stuff right, we didn't know how to build it at scale,” Patil says. A lot of data products take time to mature and yield the information you need to make them better. “This can be so hard that even a company like Apple sometimes has to apologize to customers for what was arguably a poor quality data product and recommend competitor applications,” says Belkin. This issue impacts companies of all sizes and skill levels. At LinkedIn, the “People You May Know” feature started with a big python script on one engineer's laptop. It wasn't until 2008, two years after the feature launched, that it started to drive reasonable growth on the platform. The same thing happened with Twitter Search. It was first launched as a utility for Twitter users. But not until mid-2013 did it become a major driver of traffic and engagement. Never try to launch a complicated data product on a fixed schedule. DJ Patil Speaking at CTO Summit in San Francisco. A lot of people choose to start building by modeling the product in question. Some start with feature discovery or feature engineering. Others start with building the infrastructure to serve results at scale. But for Belkin, there's only one right answer and starting point for a data product: Understanding how will you evaluate performance and building evaluation tools. To reinforce these lessons, Belkin starts his staff meetings with a quick dashboard review. He personally looks at it 20+ times a day, but finds that discussing it actively surfaces problems and the potentiality for problems much faster. As a result, they get addressed faster, before they have a chance to be disastrous. Early in his career, Belkin worked at Netscape, and remembers CEO Jim Barksdale — formerly of FedEx — saying, “Look, if you miss delivering 1% of packages every day, in 100 days, a significant customer base will actually be upset.” What you need to consider is how often will users be seeing bad results? You have to put whatever you're displaying in front of a user in his or her frame of reference. They have to understand that they're seeing information because of something concrete — either because they follow a certain user, or they took a certain action, or even perhaps, because they didn't take an action. The important thing is that you can't present data or information that is disconnected from the user's past experience with your brand or product. No one wants things to happen or appear randomly. Ambiguity will lose users. 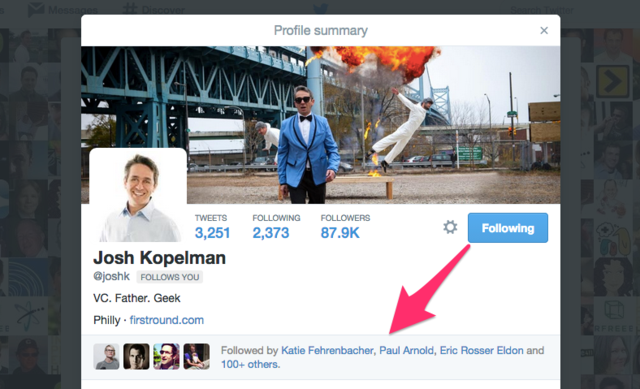 A Twitter profile placed in the context of the people you already know who follow the person will make you much more likely to follow them as well, for instance. That's the clear next action. First, you have to make sure there's no possibility of leakage of personally identifiable information. This is no joke. There is always some risk that this could happen due to a flaw in product design or implementation. You may be hacked. Some of your data may not be encrypted or anonymized properly. This is all very serious. You have to do everything in your power to not just prevent this from happening, but convey through good design and solid user experience that you will not let this happen. Users pick up on the smallest of cues to determine whether they should trust a product or not. The way you present user settings — especially as they pertain to privacy — is very important. You need to think of the best way to do this that doesn't overwhelm people, but present their options clearly, and makes them feel like they have total agency over what they share with who and when. This is often the difference between whether a person ever comes back or not. Five - There Are Users Outside of the U.S.
A surprising number of people don't realize that the majority of their users live outside of the United States. “In my experience, as many as 35 languages could be relevant to your company. Often data and choices become more limited in different languages. Many users are multi-lingual. You may not be able to deliver the same quality of experience to everyone without a lot of additional effort unless you plan for it," Belkin says. Even if you're at a small startup now that lacks the bandwidth to think about internationalization, these are concerns you need to lay the groundwork to address. You can't have a huge product entirely in English and suddenly decide it all needs to be in 35+ languages. If you have global aspirations, you have to start layering this in when it still feels premature. Belkin gets this question all the time: How do you organize your product and engineering teams in situations when you're building and iterating more than one product at a time? What's the right configuration of people? “This brings up an age old debate: Should you go vertical or horizontal?” What's the right answer? “There isn't a generic right answer, but there is a right answer for the stage of company you're at,” says Belkin.“I like to think about it in the form of a feature matrix, like this:"
Generally speaking, vertically-integrated teams win when it comes to speed of execution or innovation. People are happier and external relationships are better simply because the team is more aligned with business objectives. 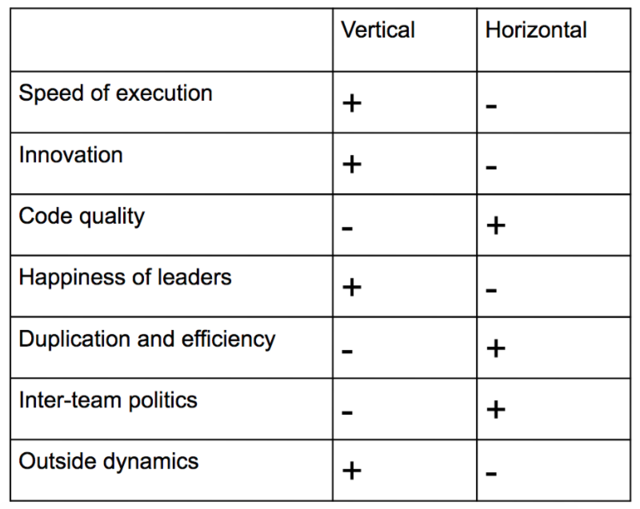 Horizontal teams normally produce higher quality output. They are more efficient and generally are better at inter-team dynamics. The real key is to keep experimenting and iterating not just with products, but how you build them as well. You aren't going to solve the way you work all at once. New data will be revealed that you can channel back into your process. Don't expect to nail it out of the shoot — and especially don't expect the same level of ease to continue as your audience and company grow.